Fight the Racist Immigration Act! Join the day of action. End all immigration checks! Decent housing, healthcare and jobs for all! The 2016 Immigration Act builds on the 2014 Immigration Act. They tighten Britain's already racist immigration controls in order to make a "hostile environment" for migrants by making it easier to deport people and severely restricting access to services. We are having this day of action to fight back against these racist laws. Get in touch and see below to find out how you can get involved in your local area. The Migration and Asylum Justice forum made the call out for a march against the racist Immigration Act. This took place in Newcastle on 25th June 2016. 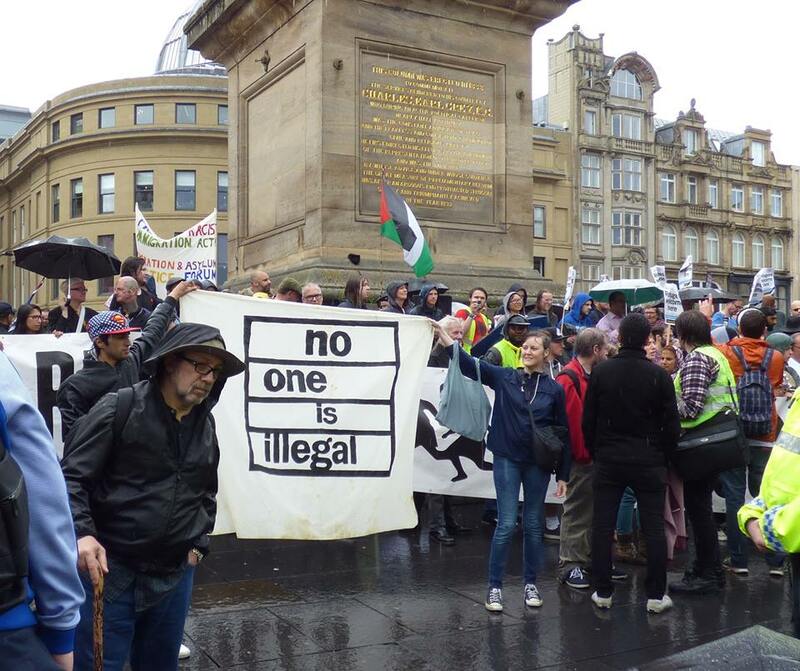 Anti-racist groups and individuals joined the march from Dundee, Edinburgh, Gateshead, Glasgow, Manchester, Nottingham, Sheffield and Sunderland. It was a big success. We all agreed that the next step was to keep up the pressure by having protests in our local areas against the Immigration Act. 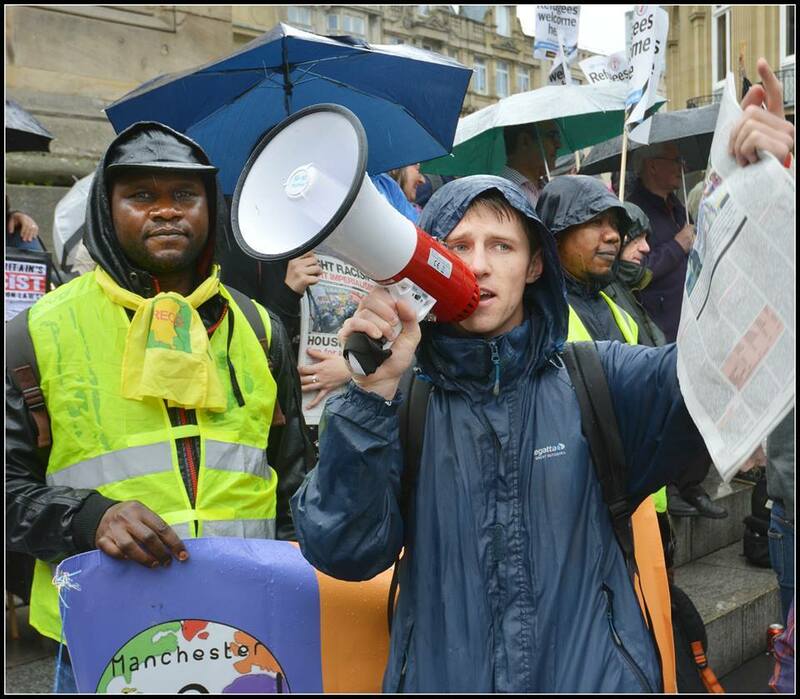 We felt that a coordinated day of action could have a massive impact in getting the Immigration Act scrapped and raising awareness about the intensified governmental racism against migrants and asylum seekers. This will take place on Saturday 13th August 2016. Fight the racist Immigration Act. Decent housing, healthcare and jobs for all. You may want to have additional demands that relate to your local context and the type of action you are taking. Please check the ‘Protest Map’ page to see if their is a protest in your local area. If there isn’t, why don’t you call a protest or march or rally yourself? Get in touch and we can help you organise this and put you in touch with other groups and anti-racists in your area. Also, check out the ‘Ideas for Action’ page to see what you could do. We will be updating this website with other resources you can make use of. Also, please feel free to send us any relevant information, articles, videos and photos and we will post them. And if you have any ideas of what people can do and how we can publicise the day of action to make it as big and successful as possible, please get in touch. After the events have taken place we will also need reports and footage of what you have done, so please send that in!